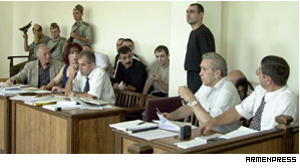 In a new courtroom where the accused does not get caged, John Harutyunyan (black shirt) stood to plead his case.. The trial of murdered journalist Tigran Naghdalyan resumed Tuesday, with defendant John Harutyunyan again denying that Armen Sargsyan had anything to do with Harutyunyan's killing of Naghdalyan. Against a horizon marked by an infinity of mountain and painted red by sunset, villagers lean into sofas, taking rest at the end of the day in the village of Nigavan. The most remarkable feature of the man entering this newsroom is that he is bi-pedal, ambulating in the direction of my office in a manner Nature reserved for the more deserving evolved. His species are better known for crawling, slithering maybe, and sometimes leaving slime as a record of their regrettable existence. On September 1 members of Armenia's Kurdish community joined comrades world wide in protesting treatment of the imprisoned leader of the Labor Party of Kurds (LPK), Abdullah Ocalan. Tomorrow (September 6), after two years of reconstruction the Yerevan State Puppet Theater will welcome its little audience to the first show of this theatrical season. The beginning of September means the beginning of school, and that means the beginning of good business for dealers of all things related to school life. Players of Armenian heritage continue to achieve successes at the last of this year's Grand Slams, the US Open, which began August 25 in Flushing Meadows, NY. Near her home in the center of Yerevan,Flora Sarkissyan, like many Armenian housewives after the season of sheep shearing, prepares wool that will provide warmth when a sunny September day is but a memory.